​Why Networking Monitoring Tools are Important, and How to Pick One? No matter what kind of business you are running, in order to keep pace with your competitors in today’s “connected” world, you will need a robust network that your customers, staff, and partners can rely upon. Network monitoring allows you to minimize company downtime, and thus reduce costs. It is also useful in making the most of your network resources. After all, resources that are not used to their maximum potential are a plain waste of money. With network monitoring, you can improve the existing network infrastructure in two manners: by optimizing resources and processes. Monitoring provides you a bird-eye view of your network, with which you can easily identify the nodes that are bearing the strain of the traffic, or hardware components that are failing, or broken links that need to be fixed. With a good networking monitoring tool, you don’t have to spend time validating the network links manually, or check the hardware yourself in person. You get a dedicated interface with all the numbers and charts right in front of you to observe and learn from. Depending on your choice of program, you can even get automated notifications of potential problems. Network monitoring tools are important for supplementing your network and data security. They can easily detect the source of malicious traffic, or attempts at data breaches, and even provide the recommendations for dealing with them. 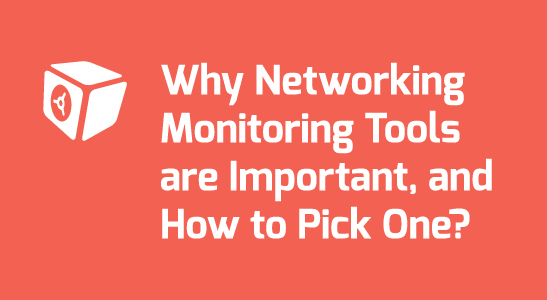 How to Pick the Best Network Monitoring Tool for Your Business? Given the importance of network monitoring tools, it is best to take your time when weighing the options. A lot of such tools are available for free, but if you are looking for something more catered towards businesses or professionals, then you might have to pay a subscription fee or buy a license. While the main purpose of a network monitoring software is to monitor your network and help keeping it operational, your choice mustn’t be limited to that. Make sure the software you choose has support for scaling, in case your business grows in the future. It should also be able to monitor other elements of your infrastructure, such as the routers, servers, etc. Finally, it will be a good thing if it can support third-party add-ons. What operating systems do you mainly use in your company? What kind of network protocols and security applications are being used? Questions like these will help you identify the right software which is fully compatible and works without any issues. Businesses don’t have enough staff to monitor their networks 24/7. Thus, automated alerting and remediation are some of the key features that you might want to look in a monitoring software. This will minimize the manpower requirement. The program should also be able to create daily reports and logs that your IT team can refer to if need be. Data Deposit Box will always be available to help clients with not only cloud backup, data storage and recovery, but also with network monitoring needs. https://datadepositbox.com/wp-content/uploads/2017/03/ddb-why-monitoring-tools-are-important.jpg 300 547 datdepbox https://datadepositbox.com/wp-content/uploads/2018/08/datadepositbox-logo.png datdepbox2017-03-24 10:14:072017-03-24 10:14:07​Why Networking Monitoring Tools are Important, and How to Pick One? 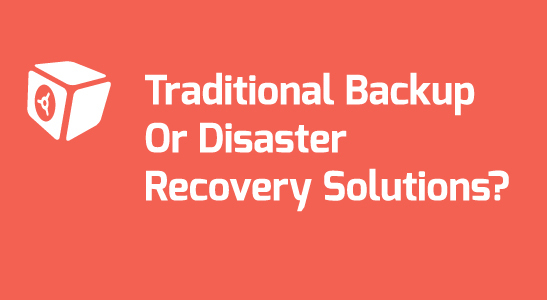 ​Traditional Backup Or Disaster Recovery Solutions? More and more businesses are embracing Data Recovery as a Service (DRaaS), as cloud solutions are trending. However, is it really the way to go? Let’s see how it holds up against the traditional backup methods. Traditional DR methods typically use magnetic tapes or disks as the primary storage. However, since magnetic tapes are pretty much non-existent in today’s IT industry, we will consider just the magnetic disks, or the hard-drive disks here. In every data backup method, whether traditional or modern, it is important to backup your data on a daily basis. While backing up data on a daily basis is a challenge in itself, if and when needed, restoration could also pose difficulties. Depending on the size of the entire backup, full restoration can take hours. In some cases, problems may also emerge because the recovery environment must be identical to the backup environment. Using mirrored servers is a much better option for going the traditional way. Every single change in the data on your side is mirrored to an off-site server. For instance, if you add a new entry on the database in your office, it will be copied to the database stored in the server. While mirrored physical servers are a good option, both in terms of reliability and also in terms of time (as no restoration is required with them), their costs could be a bit higher. Not only you have to make a huge investment initially for buying decent hardware, cooling systems, and data mobility, and security systems, but also you will need to spend a portion of your monthly cashflow for meeting the operational and maintenance costs. Cloud based data recovery methods are becoming popular for two big reasons- they are simpler, and they are inexpensive. While there is nothing wrong having an in-house cloud system, you can enjoy even more benefits by partnering up with an MSP that specialises in cloud backup and disaster recovery services. An experienced cloud service provider can provide you top-tier cloud backup solutions at affordable prices. Everything from IT standards compliance to data-breach protection, and business continuity to complete virtualization will be taken care of by them. With a major aspect of business, i.e. data protection, out of the list of things to worry about, you can focus your energy and time on other important areas. While your current backup system is working fine, will it work for you when your data grows in a few years from now? As your business scales up, you will need to scale up your data recovery system, too. If you are using a cloud backup service for your data protection, then scalability is never a problem. In fact, you also get to enjoy upgraded security measures, as most service providers upgrade their hardware and software regularly. https://datadepositbox.com/wp-content/uploads/2017/03/DDB-TraditionalBackupOrDisasterRecoverySolutions.jpg 300 547 datdepbox https://datadepositbox.com/wp-content/uploads/2018/08/datadepositbox-logo.png datdepbox2017-03-10 11:11:082017-03-10 11:11:08​Traditional Backup Or Disaster Recovery Solutions? Amongst all kinds of computer attacks, ransomware is the worst. While malware would corrupt some files, and adware might simply make your web-browser to slow down, ransomware is just a whole other ball game. Ransomware could be taken care of by implementing a decent security procedure, teaching employees about its dangers, adding good antivirus program, and using a robust cloud back service. A ransomware program encrypts and locks important files and documents on a computer. The attacker then demands a ransom in exchange for the decryption key that can unlock the computer. To stay off the radar of cyber security researchers and law enforcement agencies, these attackers usually demand payment in Bitcoins, making it even more difficult to track them down. So, what can you do to protect yourself? A cloud backup service that is capable of bare metal resource is the answer. A recent survey from Osterman Research* revealed that 21% of companies did not suffer any kind of ransomware attacks with in the previous 12 months, while double that amount, 41%, of the participating organizations suffered at least one ransomware attack during the same period. Another report** released by Symantec, revealed that there were about 130,000 ransomware infections in March 2016 alone. This is shocking, but unfortunately true. Ransomware has become a major threat for most organizations around the world. The fact that cyber criminals are able to exploit phishing emails so efficiently, and use a complex set of evasive techniques to go unnoticed by even the best security programs is a matter of concern for IT security firms. How are Hackers Able to Attack Your Systems and Get Away With it? Fast Flux, a DNS technique that helps it to remain hidden behind a constantly changing network of compromised hosts that act as proxies. Traffic anonymizers such as Bitcoin or TOR. These make it impossible for law enforcement agencies to detect it. It can become dormant if need be, and be made to attack the system when it’s most vulnerable. The fact it can be fast and super effective also helps in its execution. It takes advantage of domain shadowing that hides the communication between the downloader (payload) and server of origin. No matter how strong your security system is, there is always a possibility of a cyber attack. However, when a ransomware is involved, there is little hope for protection. The only way to protect your crucial business data from these attacks is to set a cloud backup system that is capable of bare metal restore. Ransomware hackers often destroy all of your data if the ransom is not pain on time. Thus, file systems that are in the infected machine are gone forever. If you are using an in-house, on-premise, local backup system, then a ransomware can easily render the disaster recovery mechanism useless. An experienced cloud backup solution provider, on the other hand, can provide a much better protection. Make sure that you ask for a ransomware protection when selecting the cloud backup vendor. Data Deposit Box offers a complete cloud backup and recovery solution, via software and local appliance, which provides numerous ransomware recovery options. Data Deposit Box’s technology provides ransomware recovery for granular file, folder, virtual system, databases, and complete system restores for servers and workstations in one complete SMB-focused solution. Unlike other image-based solutions that allow for ransomware recovery, Data Deposit Box provides customized, configurable and complete granular recovery solution, bare-metal and full system recovery (workstations and servers), file versioning, Point-in-Time recovery, SQL Database, Exchange, and VMWARE generation recovery; avoiding actual backup files from become infected. Please visit the Ransomware page for more information.